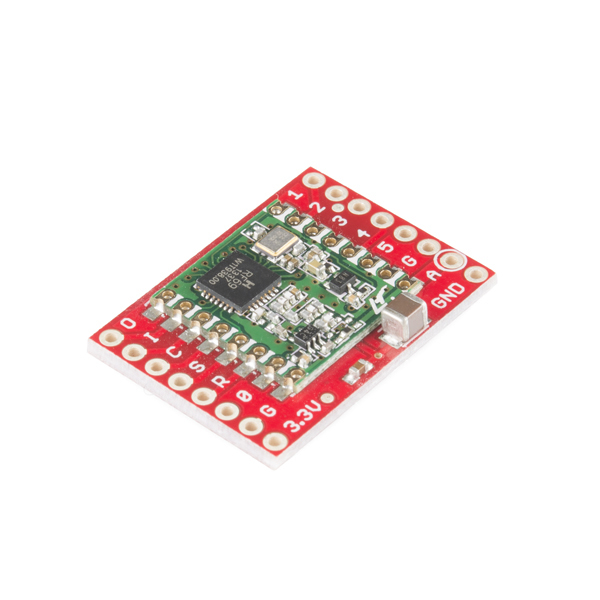 Want to be notified of new releases in sparkfun/RFM69HCW_Breakout? The RFM69HCW is an inexpensive and versatile radio module that operates in the unlicensed ISM (Industry, Science, and Medicine) radio band. It's perfect for building inexpensive short-range wireless networks of sensors and actuators for home automation, citizen science, and more. Broadly speaking, the 915MHz version is legal in ITU region 2 (North and South America, Australia, Greenland, Pacific Islands, Israel), and the 433MHz version is legal in ITU region 1 (Europe, Africa, Middle East, Russia). Other areas have mixed allocations; hobbyist use is not likely to be an issue, but if you're going to be deploying a lot of these or using them in a commercial product, check your local regulations. /Libraries/Arduino - Contains the RFM69 library written by Felix Rusu of LowPowerLab.com. See https://github.com/LowPowerLab/RFM69 for the most up-to-date version. /Libraries/Arduino/RFM69/examples - Example Arduino sketch showing how to use the SparkFun RFM69HCW breakout board. See the hook-up guide at https://learn.sparkfun.com/tutorials/rfm69hcw-hookup-guide for wiring and usage details. /documentation - Datasheets, schematic, etc. We gratefully acknowledge Felix Rusu of LowPowerLab.com for his terrific RFM69 library, which runs on his very cool Moteino hardware. A version of his library is included here for the convenience of SparkFun customers. Please see his GitHub repository for the latest version. The hardware design is released under the Creative Commons Attribution-ShareAlike 4.0 International license. Felix Rusu's RFM69 library is released under the Creative Commons Attribution-ShareAlike 3.0 license. SparkFun's example code is based on Felix Rusu's work, and is thus released under the same Creative Commons Attribution-ShareAlike 3.0 license.